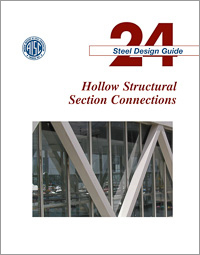 AISC Design Guide 24, Hollow Structural Section Connections, addresses bolting and welding issues for connections involving hollow structural sections (HSS), as well as providing design provisions for various configurations of HSS connections and the applicable limit states. Some of the topics included are: Moment connections; including W-shape beams to HSS columns, continuous beams over HSS columns, through-plate connections, directly welded connections Tension and compression connections; including end tee connections, slotted HSS/gusset connections, end plate on round HSS, end plates on rectangular HSS Branch loads, line loads and concentrated forces on HSS HSS-to-HSS truss connections HSS-to-HSS moment connections The Design Guide references the 2005 AISC Specification for Structural Steel Buildings and the 13th Edition AISC Steel Construction Manual. The design provisions of the 2005 Specification are presented in a convenient tabular form for easy reference and the examples give both load and resistance factor design (LRFD) and allowable strength design (ASD) solutions.